I am a romantic. I love a good love story. Creating this hand-crafted card reminds me of my softer romantic side. With the newest Designer Series Paper and Thinlits this romantic, soft, elegant thank-you card comes to life. I love how a simple, easy card can deliver a depth of love and gratitude. I adore these new Greetings Thinlits. Used with the Gold Foil Sheets it becomes a rich, high shine sentiment. The Gold Foil word picks up the polka dots (these are used to release the foil from the fine-lined die-cut) but use with wax paper over and this doesn't happen. Cut the waste when you use the Magnetic Platform on your Big Shot Die-Cutting Machine. It will hold these metal framelits/thinlits exactly where you want them and allow you to use less of the pretty paper. Ask ME how YOU can get the Big Shot Die-Cutting Machine for FREE or 1/2 OFF!! With a full collection from the one of the best catalogs in ages - you can be the first to enjoy the awesomeness and score the FREE Items when you book a Private Class with me! Now I just KNEW when I saw the sample of this pretty new Timeless Elegance Designer Series Paper in our new catalog (on page. 19, then page 28) that I had to have this paper! No words, y'all. This is the most amazing collection of paper! First, the New Catalog is delicious - filled with divine collections of papers, stamps, accessories and tools - it is one of the best in years!! Breathtaking. You don't need much when you have such a stunning image. Simply framed with a strip of Venetian Lace Crochet Trim you are highlighting the paper while complimenting it. Layered over the Cherry Cobbler card stock, this card is super easy but WOW is it pretty (if I do say so, myself). 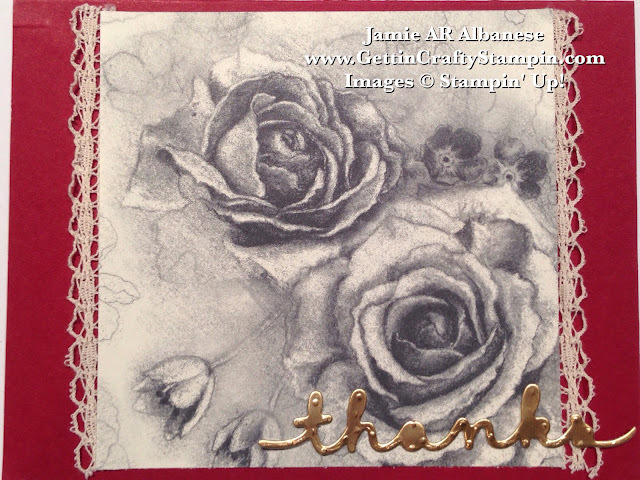 This is a fun, fast and easy hand-crafted card that reminds me of an old romantic letter from the Victorian era. 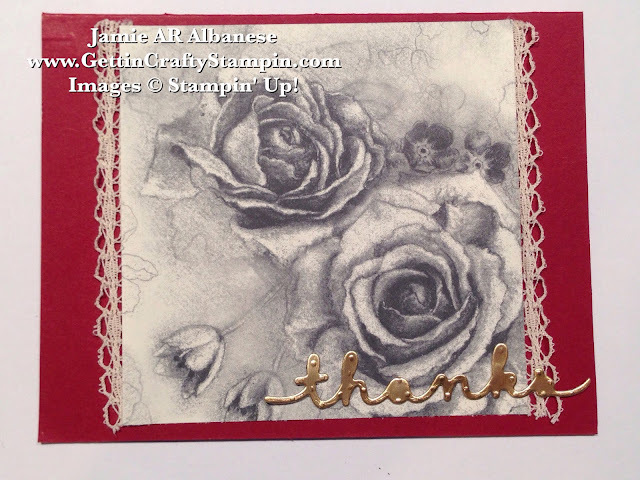 Without a single rubber stamp (sigh) this hand-crafted card delivers an elegant 'thanks' with roses that will never die. So, this card is all me and my love of romance; rich reds, vintage roses, lace... sigh. My hubby said that I am waaaaay too excited about the new catalog and I'm thinking that what shows romance is if he let me buy it all - ha, ha, ha. I hope that you enjoyed this easy to create card. Join us as we will be creating some love with the new papers, stamps and more at our Stampers 10 Club this Saturday and Sunday - come try it out!